It's all about Oculus and Facebook this week. Our big test is the Oculus Go review, we got a tease of its new Half Dome prototype with variable focus and Facebook's F8 conference continues to throw up interesting news on the future of VR. Before we get on to that, though, check out Husain's latest virtual endeavours as his diary entry this week sees him ditching his regular cardio workout for exercise in VR. Plus we argue that augmented reality's killer app should be... social interactions in Charged Up. Fed up of looking like a Looney Toon when you hang out with your friends in VR? 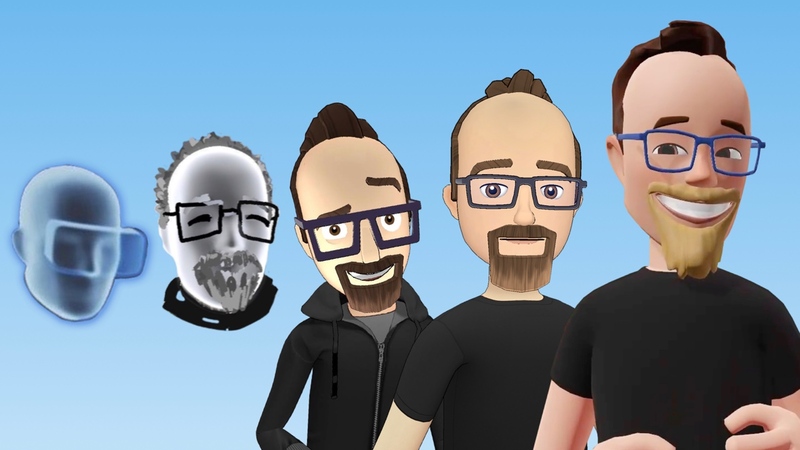 One of the most interesting things Facebook showed off this week - aside from Half Dome - is its new photo-realistic avatars for social apps like Facebook Spaces and Oculus Rooms. The rendering takes place in real time, relying heavily on AI, and the new look - much more detailed but still quite CG - avatars will be able to replicate expressions, particularly our mouths, that cartoons just can't mimic. Facebook's CTO Mike Schroepfer said the idea is that they will allow us to make deeper connections while in virtual reality but that the project is still in its early stages. Uncanny much? There's more from F8 - Red announced that its partnering with Facebook and Oculus on the first commercially available Surround 360 camera. It will capture volumetric video, via a spherical design and multiple lenses, that is then processed into a Lytro-style light field and can be experienced via VR headsets with 6DoF tracking. We've got no price or release date yet - expect it to be professional grade and expensive - and we don't know how close it will be to Facebook's $30,000 reference design but we know it will use Facebook's depth sensing tech. Plenty of AR love too from the big event in San Jose. Not only did Facebook run a (confusing) AR Scavenger Hunt for attendees, it also announced that its AR Camera Effects platform, announced last year, is coming to Instagram. AR Studio will include face filters and world effects plus you'll be able to download custom filters by third parties including BuzzFeed, Vogue and that girl Kylie Jenner. AR filters are already available on the app, as part of Facebook's efforts to compete with Snapchat. The new brand and celeb filter feature is rolling out as a closed beta to begin with. In a similar vein, Facebook is bringing AR to Messenger - again it's a closed beta and the idea is that brand can add AR filters into Messenger experiences such as trying on beauty products or clothes. Any movie fan worth their salt knows the debt we owe Georges Méliès, the illusionist and movie maker who made hundreds of early pieces of cinema around the turn of the 20th century. Google's first 360 degree VR Doodle Back to the Moon (above in 360 and on the Google homepage for a day) is an adorable animated homage to his trickery and inventiveness. If you've never heard of him, go and watch a few of his works, including A Trip to the Moon from 1902 first. An Oculus Go title in honour of that very accessible VR headset's launch this week, Republique is a VR port of the episodic stealth puzzle game on mobile. There's ten hours worth of gameplay as you hack and guide Hope through a totalitarian state. It's this kind of immersive, affordable, good-looking thriller that will help the Go do well with casual gamers.